I finished my first quilt of 2012 last week! It's a repeat of the baby quilt I had made for Kelly awhile back, but this one is for a little girl. I have had a lot of requests for a pattern for this quilt, so I'll be releasing one within in the month or two. I love the colors in this one, girly but with a little bit of an edge to it. The kelly green really pops in the chevron stripe. I quilted this one the same way I did the boy version, with straight lines parallel to each block. The back is a lime gingham, and it's bound in my favorite gray, Kona Ash. For the pattern, which sizes are you interested in? This is a larger baby quilt, about 42" x 55". Should I include a lap size and twin size as well? I'd love to hear your thoughts on size, as well as any other input on what you like/dislike about quilt patterns! I've made the circle quilt several times for friends and love the size! This looks like a great pattern and maybe not as time consuming as the circle quilt? Would also love a pattern to the ruffle quilt and any additional guidance you can provide on binding. We're still having trouble figuring that out but we usually "make it work" :) Thanks! Love your projects! Oh, I love this quilt pattern. I love the colors in this one too! For some reason I'm all about 'bigger quilts' lately, but I usually just scale smaller ones out to fit so even just the dimensions for a smaller one would be great! I just love the simplicity of this pattern. I have the boy version "pinned" to be made sometime this year. The girl version is just as beautiful. I would second the shout-out for the ruffles quilt. I loved its debut, but never could find the tutorial. Look at you taking the time to start and stop all of those quilting lines mid-quilt. It's a great effect! That is just beyond adorable! Love it! I could see this quilt on a larger (dbl/queen) bed. It would add great texture to a cleanly designed room. Super nice quilt! 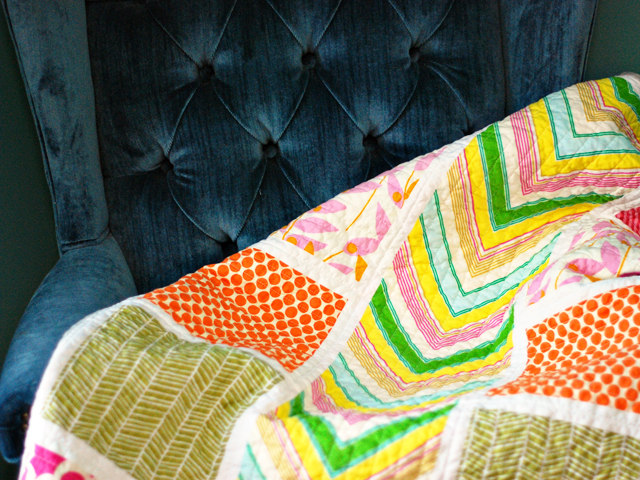 I love the fabrics you chose for this quilt! It looks amazing! 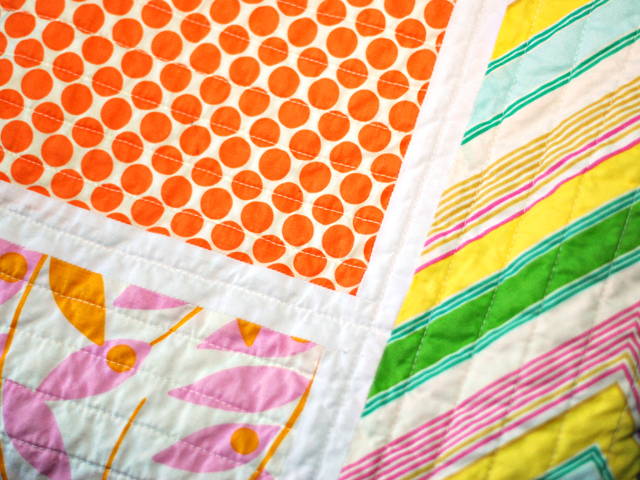 What a darling baby quilt! I love the chevron stripe in the middle. Can't wait to see the pattern. beautiful! I would love a twin size pattern and the size pictured! 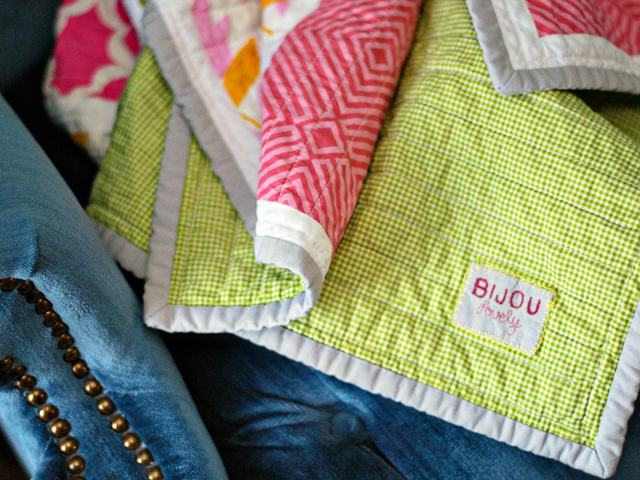 Love the baby quilt ~ I love the idea that you made it into a larger size quilt ~ they outgrow them so fast. There is so much time, effort and most of all "love" put into them, I feel like they should be made larger. I prefer to make the lap size so they can be used much longer. That is SO beautiful! I'm impressed! Holly, this is just such a happy quilt! I love it! And your tag is lovely, too! Lap size, please! The crib size gets outgrown so fast, plus the lap is more versatile. holly it is so beautiful! so bright and happy! very very pretty! 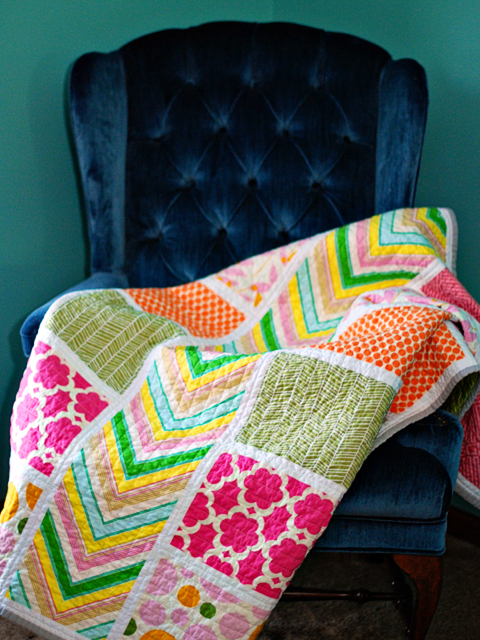 I absolutely love this quilt pattern! I am a novice quilter and an experienced quilting admirer, and I have been trying to figure out how to make this quilt at home. My best friend is having her baby shower in four weeks. Would LOVE to get my hands on the pattern! Do you have a pattern for this quilt or at least the measurements of the fabrics? I love this quilt! I wish patterns would give more sizes though. Like, explain it as a lap quilt but tell us how much extra material we'd need to turn it into a twin or even queen size. Having to figure out the math on that is frustrating. Can't wait for the tutorial! I want to make a baby quilt! Maybe on the bigger size, but not as big as a lap quilt. Thanks! I absolutely would love a tutorial! I have never made a quilt, but would love to make this one for my mom who is going through a divorce. Beautiful patterns and quilt! I wish I could just spend a few days with you. Your quilts are amazing! I love this! Can you include measurements for a king size quilt, I'm already envisioning it on my bed! I love this and would like to make it lap sized for gifts. I would love to see it as a baby quilt. The size you mentioned seems perfect. I would love the tutorial for a twin size! 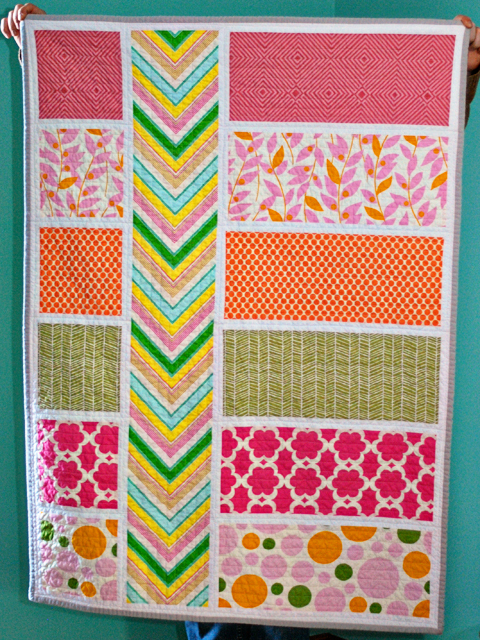 Interesting fact: I eyed the pattern and made this quilt for a baby shower. She wanted simple, elegant and modern, and the quilt fit her wish list to a T. I chose turquoise and chocolate brown colors with blue and white accents and a charcoal grey boarder with a soft flannel backing. The reason this detail is important is because another guest at the shower saw your pattern online too and made the same quilt, just with different fabric patterns. Great minds think alike, and I thought you should know that your pattern is a HIT; enough to be made for the exact same baby and show up at the exact same baby shower! I would love a pattern for the 42x55. I am hoping to start this as a baby quilt for my niece who is expecting her first child. We should know if it is a boy or girl by the end of this month so the pattern timing will be perfect! And I also would love a pattern for the ruffle quilt!!! Do you have the measurements of the fabrics? I saw this picture a couple of weeks ago, and I suddenly found out that I need to go to a shower for a single dad with a newborn (he's my cousin). I knew that this would be a fast quilt and look great, so I made a quilt inspired by your pattern mine ended up kind of bigger, it's about 50X64. I used fabrics in chocolate brown, lime and turquoise, along with white. Thank you for the inspiration. I would have purchased a pattern had I been able to find it...I think the design is that fabulous. Hi, I love this quilt pattern. I have purchased the pattern and am curious if you have any insight on turning it into a king size quilt? Thank you! How would I make this in a queen size? It's the only thing keeping me from purchasing. I want to make this quilt for my brother who is getting married this fall. And, selfishly one for my king size bed! I am making this for the daughter of a friend and would also like some insight into making it into queen size. I'm going to order the pattern and "wing it", but would appreciate any help you can provide. I just finished making this quilt using your pattern. I added a large circle bordered in white at the bottom of center stripe with a single letter monogram. It came out beautifully! Thanks so much.